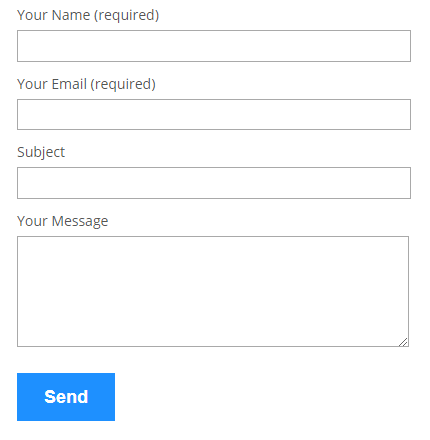 A contact form is the most straight-forward and ubiquitous way for your website visitors to send you comments and information. WordPress does not offer a native form tool, so this job calls for a plugin. Mandatory disclaimer: DO NOT INSTALL UNTRUSTED PLUGINS! Malicious plugins can compromise your website and destroy your data! I strongly suggest avoiding plugins with less than 5,000 installations and less than 4 stars. In the case of this article, I have vetted the Contact Form 7 plugin since 2012 without incident. I am in no way affiliated with the author of this plugin; I just like that it is straightforward, flexible and suits my needs as a developer. With that out of the way, let’s get a contact form set up! 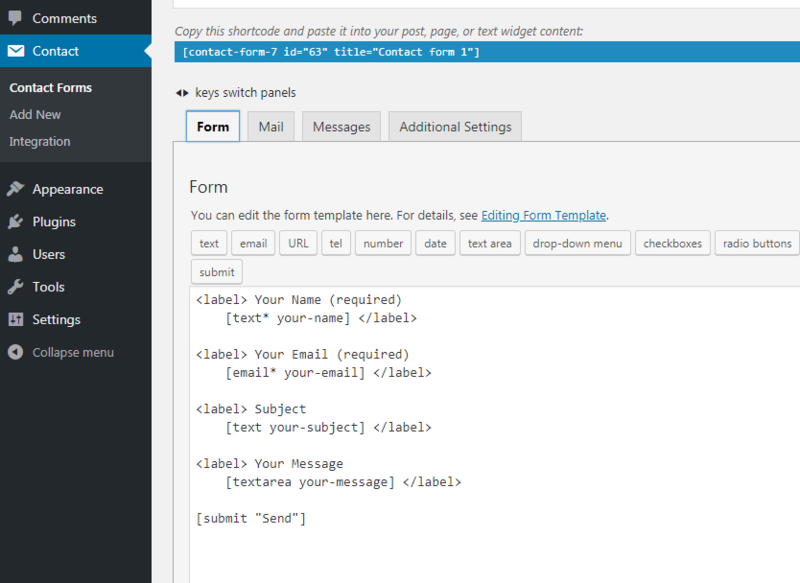 Step 1: Install the Contact Form 7 Plugin. To install, click Install Now then Activate after the installation completes (usually a matter of seconds). Step 2: Create a new form. The default form is pretty useful as-is, or you can tweak it to suit your needs. There is an Editing Form Template help page, or create your own form by using the buttons at the top of the form edit window. If you’d like to customize your form by hand, read the Advanced Tips. Inside the [square brackets] are two pieces of information: first is the type of input, next is the unique name to assign to the input. An asterisk * next to the input type designates a required field. The last item in your form should always be a submit button: [submit “Send”]. Again, the first item in the brackets is the input type (a submit button), and inside the quotes is the text to show on the button. You can customize this as well. Step 3: Configure the Mail settings. From the same page you are on, click the Mail tab to set up how your form will send emails to you. First and most important, who do you want the email sent To? Enter your preferred address for receiving emails from this form. Next, who will the email be sent From? It’s being sent from your website, but all emails need a valid sender address. This email address cannot be the same as the “To” address you entered above. I suggest no-reply@yourdomain.com where yourdomain.com needs to be the domain your form is on. 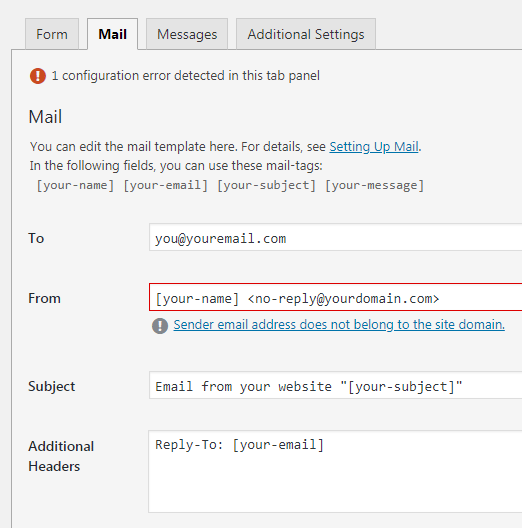 In the screenshot you’ll see an error is displayed because the example email address <no-reply@yourdomain.com> is not valid. The Subject field sets the subject of the email your form will send. “[your-subject]” will be whatever was entered in the form field [text your-subject]. Additional Headers is really handy for setting the Reply-to [your-email] to whatever your visitor entered in the [your-email] field of the form. Step 4: Add your form to a page. At the top of the page (see the Step 2 screenshot) you’ll notice the text “Copy this shortcode and paste it into your post, page, or text widget content:. That’s exactly what you need to do now. Click the shortcode to highlight the text and CTRL-C to copy it. Now navigate to the page or post you want the form to appear on. The exact appearance will be determined by your theme. There’s one last thing you’ll want to do before you break out the champagne: Test your form by sending a test to yourself. If you reply to your test email, you can have an endless conversation with yourself! Like this tutorial? 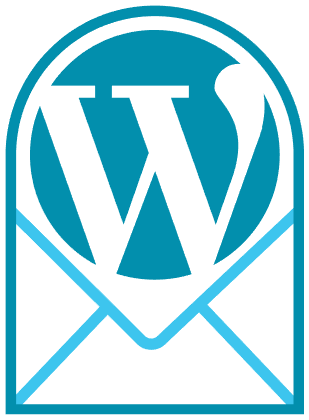 When you buy a hosting package from XMission for your WordPress site, our support team will share other tips and tricks while helping you keep your site running flawlessly. Visit our hosting page for more details.